Your next display will probably be widescreen. That's because sales of widescreen displays will quadruple this year - thanks in no small part to the support for the format from Windows Vista . Tech analyst iSuppli reckons "growing video usage...and aggressive pricing will [also] contribute to skyrocketing sales." It's thought widescreen displays will be dominant in the market by 2009. 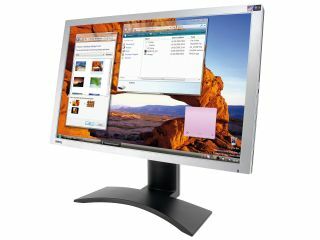 Global sales of wide LCD monitors are set to grow to 146.9 million units by 2011, rising 74.3 per cent annually. By contrast, just 9.1 million widescreen displays were sold last year. 2007 alone will see sales nearly quadruple to 35.8 million units. Rhoda Alexander, director of monitor research at iSuppli Corp, decided to outline the findings in a confusingly-phrased statement: "The wide-format cut allows for more efficient glass utilisation than standard-format panels, making the format a favourite of LCD panel manufacturers, but end-users in the monitor market have lagged behind television and notebook users in adopting the new standard." More sensibly, Rhoda thinks the growth is due, in no small part, to Microsoft 's new OS. "With the introduction of Vista, which favours a wide-format display, and attractive pricing on wide-format offerings, monitor users are finally shifting to wide alternatives."